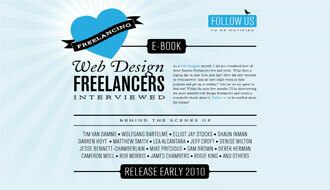 As a web designer myself, I always wondered how all these famous freelancers live and work. What does a typical day in their lives look like? How did they become so well-known? And do they really work in their pyjamas and get up at midday? Join me on my quest to find out! Within the next few months I’ll be interviewing the most talented web design freelancers and create a wonderful ebook about it. Follow us to be notified about the release!